At the Battle of Vigo Bay, English and Dutch destroyed a Spanish treasure fleet, recovering silver from the Spanish colonies to the value of about a million pounds sterling. The War of the Spanish Succession (1701-1714) was a major European conflict that arose in 1701 after the death of the last Spanish Habsburg king, Charles II. Charles had bequeathed all of his possessions to Philip, duc d'Anjou—a grandson of the French King Louis XIV—who thereby became Philip V of Spain. The war began slowly, as the Holy Roman Emperor Leopold I fought to protect his own dynasty's claim to the Spanish inheritance. As Louis XIV began to expand his territories more aggressively, however, other European nations (chiefly England and the Dutch Republic) entered on the Holy Roman Empire's side to check French expansion (and, in the English case, to safeguard the Protestant succession). Other states joined the coalition opposing France and Spain in an attempt to acquire new territories, or to protect existing dominions. The war was fought not only in Europe, but also in North America, where the conflict became known to the English colonists as Queen Anne's War. Charles II was the last Habsburg King of Spain. After his death, the War of the Spanish Succession broke out as France and Austria vied for the Spanish empire. The war lasted over a decade, and was marked by the military leadership of notable generals such as the Duc de Villars and the Duke of Berwick for France, the Duke of Marlborough for England, and Prince Eugene of Savoy for the Austrians. The war was concluded by the treaties of Utrecht (1713) and Rastatt (1714). As a result, Philip V remained King of Spain but was removed from the French line of succession, thereby averting a union of France and Spain. The Austrians gained most of the Spanish territories in Italy and the Netherlands. As a consequence, France's hegemony over continental Europe was ended, and the idea of a balance of power became a part of the international order due to its mention in the Treaty of Utrecht. 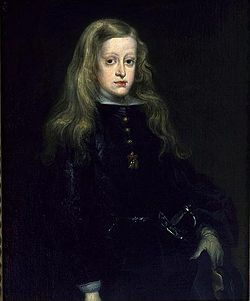 As King Charles II of Spain had been both mentally and physically infirm from a very young age, it was clear that he could not produce an heir. Thus, the issue of the inheritance of the Spanish kingdoms—which included not only Spain, but also dominions in Italy, the Low Countries, and the Americas—became quite contentious. Two dynasties claimed the Spanish throne: the French Bourbons and the Austrian Habsburgs; both royal families were closely related to the late King of Spain. The most direct and legitimate successor would have been Louis, the Grand Dauphin, the only legitimate son of King Louis XIV of France and Spanish princess Maria Theresa, herself King Charles II's elder half-sister. In addition, Louis XIV was a first cousin of his wife Maria Theresa and of King Charles II as his mother was Spanish princess Anne of Austria, the sister of King Philip IV, Charles II's father. The Dauphin, being next in the French line of succession as well, was a problematic choice: Had he inherited both the French and the Spanish realms, he would have control of a vast empire that would have threatened the European balance of power. Furthermore, both Anne and Maria Theresa had renounced their rights to the Spanish succession upon their marriages. In the latter case, however, the renunciation was widely seen as invalid, since it had been predicated upon Spain's payment of the Infanta's dowry, which in the event was never paid. 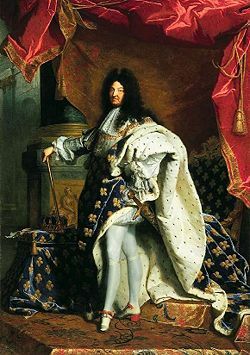 King Louis XIV of France was the most powerful monarch in Europe; it was feared that allowing his son to inherit Spain would seriously compromise the balance of power in Europe. The alternative candidate was the Holy Roman Emperor, Leopold I, of the Austrian Habsburg dynasty. He was a first cousin of the King of Spain, his mother having been another sister of Philip IV; moreover, Charles II's father, Philip IV, had given the succession to the Austrian line in his will. This candidate, too, posed formidable problems, for Leopold's success would have reunited the powerful Spanish-Austrian Habsburg empire of the sixteenth century. In 1668, only three years after Charles II had ascended, the then-childless Leopold had agreed to the partition of the Spanish territories between the Bourbons and the Habsburgs, even though Philip IV's will entitled him to the entire inheritance. In 1689, however, when William III of England required the Emperor's aid in the War of the Grand Alliance against France, he promised to support the Emperor's claim to the undivided Spanish empire. A new candidate for the Spanish throne, the Electoral Prince Joseph Ferdinand of Bavaria, had been born in 1692. Joseph Ferdinand was Leopold I's grandson, but in the female line, so he belonged not to the Habsburg but to the Wittelsbach dynasty. His mother, Maria Antonia, had been Leopold's daughter by his first marriage, to Philip IV of Spain's younger daughter Margaret Theresa. As Joseph Ferdinand was neither a Bourbon nor a Habsburg, the likelihood of Spain merging with either France or Austria remained low. Although Leopold and Louis were both willing to defer their claims to a junior line of the family—Leopold to his younger son, the Archduke Charles, and Louis to the Dauphin's younger son, the Duc d'Anjou—the Bavarian prince remained a far less threatening candidate. Accordingly, he soon became the preferred choice of England and the Netherlands. Joseph Ferdinand, moreover, would have been the lawful heir to the Spanish throne under Philip IV's will. As the War of the Grand Alliance came to a close in 1697, the issue of the Spanish succession was becoming critical. England and France, exhausted by the conflict, agreed to the Treaty of Den Haag (1698), (the First Partition Treaty), which named Joseph Ferdinand heir to the Spanish throne, but divided Spanish territory in Italy and the Low Countries between France and Austria. This decision was taken without consulting the Spanish, who vehemently objected to the dismemberment of their empire. Thus, when the Partition Treaty became known in 1698, Charles II of Spain agreed to name the Bavarian Prince his heir, but assigned to him the whole Spanish Empire, not just the parts England and France had chosen. The young Bavarian prince abruptly died of smallpox in 1699, reopening the issue of the Spanish succession. England and France soon ratified the Treaty of London, 1700 (the Second Partition Treaty), assigning the Spanish throne to the Archduke Charles. The Italian territories would go to France, while the Archduke would receive the remainder of the Spanish empire. The Austrians, who were not party to the treaty, were displeased, for they openly vied for the whole of Spain, and it was the Italian territories in which they were most interested: Richer, closer, and more governable. In Spain, distaste for the treaty was even greater; the courtiers were unified in opposing partition, but were divided on whether the throne should go to a Habsburg or a Bourbon. The pro-French statesmen, however, were in the majority, and in October 1700, Charles II agreed to bequeath all of his territory to the Dauphin's second son, the duc d'Anjou. Charles took steps to prevent the union of France and Spain; should Anjou have inherited the French throne, Spain would have gone to his younger brother, the duc de Berri. After Anjou and his brother, the Archduke Charles was to have been next in the line of succession. When the French court first learned of the will, Louis XIV's advisors convinced him that it was safer to accept the terms of the Second Partition Treaty, of 1700, than to risk war by claiming the whole Spanish inheritance. However, Jean-Baptiste Colbert, marquis de Torcy, the French foreign secretary, successfully argued that whether France accepted the whole or a part of the Spanish Empire, it would still have to fight Austria, which did not accept the nature of the partition stipulated by the Treaty of London, 1700. Furthermore, the terms of Charles' will stipulated that Anjou was only to be offered the choice of the whole Spanish Empire or nothing; if he refused, the entire inheritance was to go to Philip's younger brother Charles, duke of Berry, or to Archduke Charles of Austria if the duke of Berry refused. Knowing that the Maritime Powers—England and the United Provinces—would not join France in a fight to impose the partition treaty on the unwilling Austrians and Spanish, Louis determined to accept his grandson's inheritance. Charles II died on November 1, 1700, and on November 24, Louis XIV proclaimed Anjou King of Spain. The new King, Philip V, was declared ruler of the entire Spanish empire, contrary to the provisions of the Second Partition Treaty. William III of England, however, could not declare war against France, since he did not have the support of the elites who determined policy in both England and the United Provinces. He reluctantly recognized Philip as king in April 1701. Louis, however, took too aggressive a path in his attempt to secure French hegemony in Europe. He cut off England and the Netherlands from Spanish trade, thereby seriously threatening the commercial interests of those two countries. 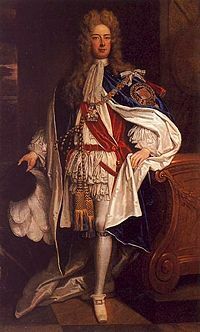 William III secured the support of his subjects and negotiated the Treaty of Den Haag with the United Provinces and Austria. The agreement, reached on September 7, 1701, recognised Philip V as King of Spain, but allotted Austria that which it desired most: The Spanish territories in Italy, forcing it to accept as well the Spanish Netherlands, thus protecting that crucial region from French control. England and the Netherlands, meanwhile, were to retain their commercial rights in Spain. A few days after the signing of the treaty, the former King of England, James II (who had been deposed by William III in 1688) died in France. Although Louis had treated William as King of England since the Treaty of Ryswick, he now recognized James II's son, James Francis Edward Stuart (the "Old Pretender"), as the rightful monarch. England and the United Provinces had already begun raising armies; Louis's action alienated the English public even further, and gave William grounds for war. Armed conflict began slowly, as Austrian forces under Prince Eugene of Savoy invaded the Duchy of Milan, one of the Spanish territories in Italy, prompting French intervention. England, the United Provinces, and most German states (most notably Prussia and Hanover), sided with Austria, but the Wittelsbach Electors of Bavaria and Cologne, the King of Portugal, and the Duke of Savoy supported France and Spain. In Spain, the cortes of Aragon, Valencia, and Catalonia (most of the kingdoms of the Crown of Aragon) declared themselves in favour of the Austrian Archduke. Even after William III died in 1702, his successor in England, Anne, continued the vigorous prosecution of the war, under the guidance of her ministers Godolphin and Marlborough. At the Battle of Vigo Bay, English and Dutch destroyed a Spanish treasure fleet, recovering silver to the value of about a million pounds sterling. There were two main theaters of the war in Europe: Spain and West-Central Europe (especially the Low Countries). The latter theater proved the more important, as Prince Eugene and the English Duke of Marlborough each distinguished themselves as military commanders. There was also important fighting in Germany and Italy. In 1702, Eugene fought in Italy, where the French were led by the Duc de Villeroi, whom Eugene defeated and captured at the Battle of Cremona (February 1). Villeroi was now replaced by the Duc de Vendôme, who, despite a drawn battle at Luzzara in August and a considerable numerical superiority, proved unable to drive Eugene from Italy. In the meantime, Marlborough led combined English, Dutch, and German forces in the Low Countries, where he captured several important fortresses, most notably Liège. On the Rhine, an Imperial army under Louis of Baden captured Landau in September, but the threat to Alsace was relieved by the entrance of the Elector of Bavaria into the war on the French side. Prince Louis was forced to withdraw across the Rhine, where he was defeated by a French army under Claude-Louis-Hector de Villars at Friedlingen. The English admiral Sir George Rooke also won an important naval battle, the Battle of Vigo Bay, which resulted in the complete destruction of the Spanish treasure fleet and in the capture of tons of silver. Next year, although Marlborough captured Bonn and drove the Elector of Cologne into exile, he failed in his efforts to capture Antwerp, and the French were successful in Germany. A combined Franco-Bavarian army under Villars and Max Emanuel of Bavaria defeated Imperial armies under Louis of Baden and Hermann Styrum, but the Elector's timidity prevented a march on Vienna, which led to Villars's resignation. French victories in south Germany continued after Villars' resignation, however, with a new army under Camille de Tallard victorious in the Palatinate. French leaders entertained grand designs, intending to use a combined French and Bavarian army to capture the Austrian capital the next year. By the end of the year 1703, however, France had suffered setbacks for Portugal and Savoy had defected to the other side. Meanwhile, the English, who had previously held the view that Philip could remain on the throne of Spain, now decided that their commercial interests would be more secure under the Archduke Charles. The Duke of Marlborough was the commander of the English, Dutch and German forces. He inflicted a crushing defeat on the French and Bavarians at the Battle of Blenheim. In 1704, the French plan was to use Villeroi's army in the Netherlands to contain Marlborough, while Tallard and the Franco-Bavarian army under Max Emanuel and Ferdinand de Marsin, Villars's replacement, would march on Vienna. Marlborough—ignoring the wishes of the Dutch, who preferred to keep their troops in the Low Countries—led the English and Dutch forces southward to Germany; Eugene, meanwhile, moved northward from Italy with the Austrian army. The objective of these manœuvres was to prevent the Franco-Bavarian army from advancing on Vienna. Having met, the forces under Marlborough and Eugene faced the French under Tallard at the Battle of Blenheim. The battle was a resounding success for Marlborough and Eugene, and had the effect of knocking Bavaria out of the war. In that year, England achieved another important success as it captured Gibraltar in Spain, with the help of Dutch forces under the command of Prince George of Hesse-Darmstadt, and initially on behalf of the Archduke Charles. Following the Battle of Blenheim, Marlborough and Eugene separated again, with the former going to the Low Countries, and the latter to Italy. In 1705, little progress was made by either France or the allies in any theater. Marlborough and Villeroi maneuvered indecisively in the Netherlands, and the story was much the same for Villars and Louis of Baden on the Rhine, and Vendôme and Eugene in Italy. 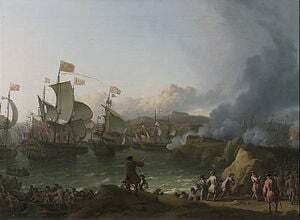 The stalemate was broken in 1706, as Marlborough drove the French out of most of the Spanish Netherlands, decisively defeating troops under Villeroi in the Battle of Ramillies in May and following up with the conquest of Antwerp and Dunkirk. Prince Eugene also met with success; in September, following the departure of Vendôme to shore up the shattered army in the Netherlands, he and the Duke of Savoy inflicted a heavy loss on the French under Orleans and Marsin at the Battle of Turin, driving them out of Italy by the end of the year. Now that France had been expelled from Germany, the Low Countries and Italy, Spain became the center of activity in the next few years. In 1706, the Portuguese general Marquês das Minas led an invasion of Spain from Portugal, managing to capture Madrid. By the end of the year, however, Madrid was recovered by an army led by King Philip V and the Duke of Berwick (the illegitimate son of James II of England, serving in the French army). Galway led another attempt on Madrid in 1707, but Berwick roundly defeated him at the Battle of Almansa on April 25. Thereafter, the war in Spain settled into indecisive skirmishing from which it would not subsequently emerge. In 1707, the War briefly intersected with the Great Northern War, which was being fought simultaneously in Northern Europe. A Swedish army under Charles XII arrived in Saxony, where he had just finished chastising the Elector Augustus II and forced him to renounce his claims to the Polish throne. Both the French and the Allies sent envoys to Charles's camp, and the French hoped to encourage him to turn his troops against the Emperor Joseph I, who Charles felt had slighted him by his support for Augustus. However, Charles, who liked to see himself as a champion of Protestant Europe, greatly disliked Louis XIV for his treatment of the Huguenots, and was generally uninterested in the western war. He turned his attention instead to Russia, ending the possibility of Swedish intervention. 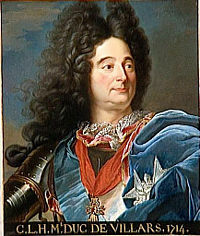 Later in 1707, Prince Eugene led an allied invasion of southern France from Italy, but was stalled by the French army. Marlborough, in the meantime, remained in the Low Countries, where he was caught up in capturing an endless succession of fortresses. In 1708, Marlborough's army clashed with the French, who were beset by leadership problems: Their commanders, the Duc de Bourgogne (Louis XIV's grandson) and the Duc de Vendôme were frequently at variance, the former often making unwise military decisions. Bourgogne's insistence that the French army not attack led Marlborough once again to unite his army with Eugene's, allowing the allied army to crush the French at the Battle of Oudenarde, and then proceeded to capture Lille. In Italy, Austrian tried to keep the leadership even by sacking cities, as Forlì (1708). The disasters of Oudenarde and Lille led France to the brink of ruin. Louis XIV was forced to negotiate; he sent his foreign minister, the Marquis de Torcy, to meet the allied commanders at The Hague. Louis agreed to surrender Spain and all its territories to the allies, requesting only that he be allowed to keep Naples (in Italy). He was, moreover, prepared to furnish money to help expel Philip V from Spain. The allies, however, imposed more humiliating conditions; they demanded that Louis use the French army to dethrone his own grandson. Rejecting the offer, Louis chose to continue fighting until the bitter end. He appealed to the people of France, bringing thousands of new recruits into his army. In 1709, the allies attempted three invasions of France, but two were so minor as to be merely diversionary. A more serious attempt was launched when Marlborough and Eugene advanced toward Paris. They clashed with the French under the Duc de Villars at the Battle of Malplaquet, the bloodiest battle of the war. Although the allies defeated the French, they lost over twenty thousand men, compared with only ten thousand for their opponents. The allies captured Mons but were unable to follow up their victory. The battle marked a turning point in the war; despite winning, the allies were unable to proceed with the invasion, having suffered such tremendous casualties. Marshal Villars (1653-1734) rescued the French fortunes in the War of the Spanish Succession. Villars, along with Turenne and Luxembourg, was one of Louis's greatest battlefield generals. In 1710, the allies launched a final campaign in Spain, but failed to make any progress. An army under James Stanhope reached Madrid together with the Archduke Charles, but it was forced to capitulate at Brihuega when a relief army came from France. The alliance, in the meantime, began to weaken. In Great Britain, Marlborough's powerful political influence was lost, as the source of much of his clout—the friendship between his wife and the Queen—came to an end, with Queen Anne dismissing the Duchess of Marlborough from her offices and banishing her from the court. Moreover, the Whig ministry which had lent its support to the war fell, and the new Tory government that took its place sought peace. Marlborough was recalled to Great Britain in 1711, and was replaced by the Duke of Ormonde. In 1711, the Archduke Charles became Holy Roman Emperor as Charles VI following the sudden death of Joseph, his elder brother; now, a decisive victory for Austria would upset the balance of power just as much as a victory for France. The British, led by Secretary of State Henry St John, began to secretly correspond with the Marquis de Torcy, excluding the Dutch and Austrians from their negotiations. The Duke of Ormonde refused to commit British troops to battle, so the French under Villars were able to recover much lost ground in 1712, such as at the Battle of Denain. Peace negotiations bore fruit in 1713, when the Treaty of Utrecht was concluded, and Great Britain and the Netherlands ceased fighting France. Barcelona, which had supported the Archduke's claim to the throne of Spain and the allies in 1705, finally surrendered to the Bourbon army in September 11, 1714, following a long siege, ending the presence of the allies in Spain. Nowadays this date is remembered as the National Day of Catalonia. Hostilities between France and Austria lumbered on until 1714, when the Treaties of Rastatt and Baden were ratified, marking the end of the War of the Spanish Succession. Spain was slower in ratifying treaties of peace; it did not formally end its conflict with Austria until 1720, after it had been defeated by all the powers in the War of the Quadruple Alliance. Under the Peace of Utrecht, Philip was recognized as King Philip V of Spain, but renounced his place in the French line of succession, thereby precluding the union of the French and Spanish crowns (although there was some sense in France that this renunciation was illegal). He retained the Spanish overseas empire, but ceded the Spanish Netherlands, Naples, Milan, and Sardinia to Austria; Sicily and parts of the Milanese to Savoy; and Gibraltar and Minorca to Great Britain. Moreover, he granted the British the exclusive right to slave trading in Spanish America for thirty years, the so-called asiento. With regard to the political organization of their kingdoms, Philip issued the Decretos de Nueva Planta, following the centralizing approach of the Bourbons in France, ending the political autonomy of the kingdoms of the Crown of Aragon; territories in Spain that had supported the Archduke Charles and up to then had kept their institutions in a framework of loose dynastic union. On the other hand, the Kingdom of Navarre and the Basque Provinces, having supported the king against the Habsburg pretender, did not lose their autonomy and retained their traditional differentiated institutions and laws. No important changes were made to French territory in Europe. Grandiose imperial desires to turn back the French expansion to the Rhine which had occurred since the middle decades of the seventeenth century were not realized, nor was the French border pushed back in the Low Countries. France agreed to stop supporting the Stuart pretenders to the British throne, instead recognizing Anne as the legitimate queen. France gave up various North American colonial possessions, recognizing British sovereignty over Rupert's Land and Newfoundland, and ceding Acadia and its half of Saint Kitts. The Dutch were permitted to retain various forts in the Spanish Netherlands, and were permitted to annex a part of Spanish Guelders. With the Peace of Utrecht, the wars to prevent French hegemony that had dominated the seventeenth century were over for the time being. France and Spain, both under Bourbon monarchs, remained allies during the following years. Spain, stripped of its territories in Italy and the Low Countries, lost most of its power, and became a second-rate nation in Continental politics. Brodrick, Thomas. A Compleat History of the Late War in The Netherlands Together with an Abstract of the Treaty of Utrecht. London: William Pearson, 1713. OCLC 3531294. Kamen, Henry. The War of Succession in Spain, 1700-15. Bloomington: Indiana University Press 1969. ISBN 9780253190253. Lynn, John A. The French wars 1667–1714: The Sun King at War. Osprey Publishing, 2002. ISBN 9781841763613. Wolf, John B. The Emergence of the Great Powers, 1685-1715. Westport, Conn: Greenwood Press 1983. ISBN 9780313240881. History of "War of the Spanish Succession"
This page was last modified on 18 October 2016, at 14:46.